Abmar Barbosa Jiu-Jitsu Academy - Virginia, Washington D.C.
Abmar Barbosa is a Brazilian Jiu-Jitsu (BJJ) black belt under Robert Drysdale. He holds an extensive list of competitive grappling achievements. Abmar is commonly known for his crowd pleasing and aggressive guard game. He shocked the BJJ community at the 2010 Pan American Jiu-Jitsu Championship by dominating the heavy favorite to win the competition, Kron Gracie. Abmar was born in 1983 and grew up at Rio Claro in the State of Sao Paulo, Brazil. He started training Jiu-Jitsu to learn a little self-defense. As the BJJ bug grew in him, he started training more and more until it became his profession. He often says, “Anger brought me to Jiu-Jitsu, but love made me stay.” (Rough translation.) He met Robert Drysdale in Sao Paulo at Brasa’s Head Quarters, a team with which he was training at the time. Abmar later moved to the U.S. and found a master in Drysdale. After a period training with the ADCC Absolute 2007 Champion, he received his black belt (in August 2008) from Drysdale and Felipe Vidal. 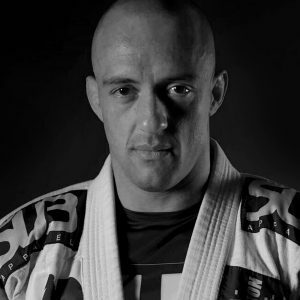 Abmar Barbosa trained with Felipe Vidal (who coaches in a nearby town) until November 2009 when he decided, after winning the Rickson Gracie Open Cup in Japan, to establish his own academy in the United States. He called this institution Abmar Barbosa Jiu-Jitsu. It is located in the Washington. D.C. area. Although Abmar has always been a very tough competitor with over 40 titles in Jiu-Jitsu, it wasn’t until April 2010 that he got a few heads turning his way. This happened at the Jiu-Jitsu Pan Americans as he shocked the BJJ world by defeating heavy favorite Kron Gracie in the first fight of the competition, winning by 11-0. He went on to win against another high-profile figure Lucas Leite submitting him, ultimately ending in the second place of the competition. After his amazing performance in the Pan Ams, he received a hurray of praises and gained many fans, who congratulated him through email and on forums all over the world. He thanked all those who supported him.